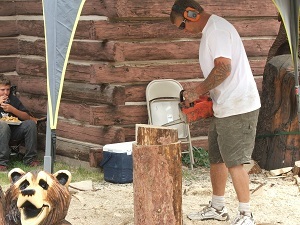 Every year during the third weekend in July the Town of South Fork holds its annual Logger Days Festival. The Festival starts on Friday and goes through Sunday. The Logger Days Festival has been held in South Fork for over 25 years. The festival has something of interest for every age. For the kids there are saw dust hunts, balloon darts, and a duck pond. While the adults can enjoy the numerous craft and food booths, live music, watching the logging competition, and watching wood carvings done on site. On Friday the main activities included a farmer’s market from 8:00 a.m. to 12 p.m. at the Visitor’s Center and the craft fair from 1:00 p.m. to 5:00 p.m. 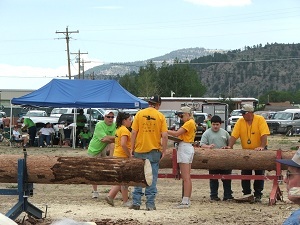 The logging competition begins on Saturday at 12:00 p.m. and Sunday’s competition begins at 10:00 a.m. 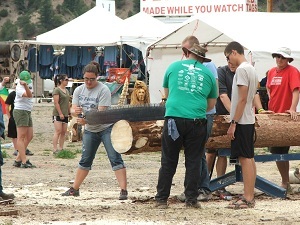 Participants in the logging events were competing for $2,500 in cash prizes. The logging competitions included an axe throw, plunge cut, timed wood chop, choker race, hanger cut, wrapper throw, speed cut, and two man cross cut. There are bleachers available to sit and watch the competition, but they are in the elements including sun and occasionally rain. Many people brought their own lawn chairs and enjoyed the competition under a large tent area. Be sure to bring sun screen, a hat, and a jacket in case the weather changes. 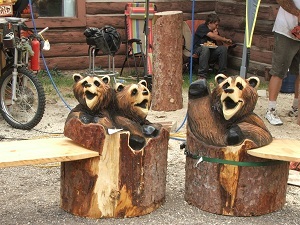 We (Debbie and husband) enjoyed watching the different events at the 2011 Logger Days. We were especially impressed with the speed cut. This is where the competitor uses his chainsaw to cut through a log in both an upward and downward motion. Wow, what a sharp chain saw can do! A couple of the competitors cut through the log in about twelve seconds. There was also an amateur competition where teams of four people were chosen from the audience. They were timed doing different types of activities in a relay. The first person had to throw an axe into a piece of wood which was hanging above the ground. Once the axe stuck into the wood, the second person then grabbed a cable and ran to a down log. There they had to place the cable around the log. After that was completed, the last two competitors then operated a two man saw and cut through a log (which is called the two man cross cut). It was enjoyable to watch the different people perform their part of their team activity. One competitor took about 12 tries to finally get the axe to stick in the wood. The two man cross cut was fun to watch as the two people had to synchronize their motions to make the saw cut. Once they figured out the synchronized motion, they really began to saw quickly, but as time went on, they started getting a little exhausted and slowed down. What great sports these amateurs were to compete. 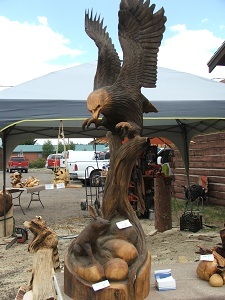 Another great part of Logger Days is the wood carvings. In 2011 Ken Braun from Cortez, Colorado displayed his talents. What an artist! His wood carvings were absolutely beautiful. Tickets were sold for a chance to win one of four wood carvings by Mr. Braun. He also offered his artwork for sale. Each year attracts more people to the competition. 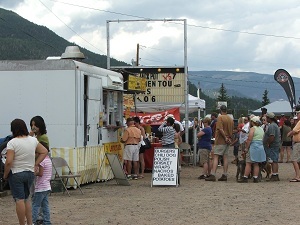 In 2011 there were about 70 food and craft booths. Vendors were selling jewelry, metal art, wood art, glass art, paintings, photography, sculptures, handmade craft items and even a booth with blacksmith crafts. This blacksmith vendor had his anvil set up and demonstrated his craft. Food ranged from the portable coffee house, Blessed Brews, (which is run by a good friend of ours—tell Dee Dee hello), turkey legs, fajitas, corn dogs, homemade root beer, and fried potatoes. We enjoyed a turkey leg and an order of fried potatoes. It was fun to watch the way the potatoes were prepared. They had a potato cutter which was operated by a drill to spin and slice the potatoes into beautiful ribbon fries. And my goodness, they were good! It was estimated over a couple hundred people attended the 2011 festival. Make sure to be one of those on lookers, or a competitor, for next year’s Logger Days festival.